Holy Moly! 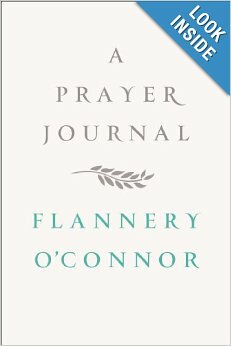 Flannery O’Connor’s Prayer Journal is a Hit! Marilynne Robinson’s review of this new O’Connor book (really an unedited—by O’Connor– journal written in a spiral notebook when she was but 20 years old and enrolled in the Iowa Writer’s Workshop) is both stimulating and revealing. Robinson was an inspired choice for the job by the editors of the NYT Book Review. It is amazing to me that so many years after her death, O’Connor has suddenly become trendy. Her name is now everywhere in highbrow circles, scholars, authors and publishers are mining it for everything they can get. The New Yorker published a long excerpt (entitled “My Dear God”) from this journal prior to the book’s publication, and now the NYT Book Review publishes an appreciative review … All very curious to me. Flannery O’Connor, considered a freak and hick by many in the literary world during her lifetime and whose characters and stories were often dismissed as “grotesque,” has strangely in recent times become “cool.” Cool? Forgive me if I doubt the sincerity behind all this after-the- fact applause and adulation. There are fads and trends among Lit Wits exactly as there are among the hoi poloi. It’s cool to dig FOC because she is the coolest, if only for the moment. Major writers and their works have an ebb and flow in critical estimation and regard, they come and they go, they have phases and cycles of appreciation and interest like the moon and the tides. O’Connor is the hotty today (so bizarre to me), but you can bet your own sweet library, every last book in it, that ten years from now it will be someone else. Byron? Chaucer? Eliot? Even you could be the golden child of the hoity toity down the road, who knows? Yet in the case of FOC, the religion card or angle is especially interesting because I think Catholic authors, the best and most literary of them, have always been a fascinating puzzle to the literary world, if not an irritant. Makes them scratch their heads and wonder: How can they write so well and originally, how can they be so sophisticated and well read and educated, and still (I can hear this behind closed doors—and have, in fact) Goddammit, for Chrissake, be … well, hell! You know, how can they actually believe in God? And worse (ick!) be Catholic? A mere coincidence, I’m sure (? ), that Canadian short story master Alice Munro, this year’s recipient of the Nobel Prize for Literature, is also a Catholic. Maybe Catholic is trending? The Colbert Effect? This entry was posted in Book Reviews, Literature, writing and tagged Catholic, Catholic authors, Catholic Church, Flannery O'Connor, Flannery O'Connor's Prayer Journal, Holy Spirit, Iowa Writers Workshop, Marilynne Robinson, New York Times Book Review, The Atlantic, The Believer. Bookmark the permalink. 5 Responses to Holy Moly! Flannery O’Connor’s Prayer Journal is a Hit! Still can’t figure whether to count it tragic or heroic for gifted people to gain appreciation after the fact, often terminally after the fact. Flannery O’Connor, Martin Luther King jr, Princess Di, heck, even Jesus – random examples, I know (long day), but hopefully you see my point. They’re shunned or maltreated one way or another whilst they’re alive, and idolized after they die. The whole ahead-of-their-time-thing I get, but still, it’s just kinda scary to think how obvious their virtuosity is now and consider how obscure, to some, it was then. Crazy old world we live in. As for catholics whose faith inspired their work, man are you right, the list is indeed long. Bono, Ayrton Senna (my personal favourite. His charisma and talent was undoubtedly down to his faith), pretty much every generation of the Brazil national football team, Jim Caviezel, Copernicus, Da Vinci, Marie Curie. I mean, between being a German Jew (don’t get me started) and catholic you could probably account for half the world’s major philosophical/art advances. Thanks for visiting, Micah. Yeah, sad and disconcerting. Really new important/necessary ideas, however embodied, whether in science or the arts, have always been considered crazy and dangerous. They are ridiculed, dismissed, or persecuted. It is scary, as you say. Just look at history. Yet they somehow survive, and not only that– their creators are resurrected, their names and work are rehabilitated, and achieve some sort of immortality. Tragic yet noble at once. Heroic? Beyond me, but it’s the pattern.